Even though this photo is with my younger sister, my older brother Matt was the reason I started playing. Just like any older sibling, I had to do everything he did. Once I picked up my first stick I was hooked. 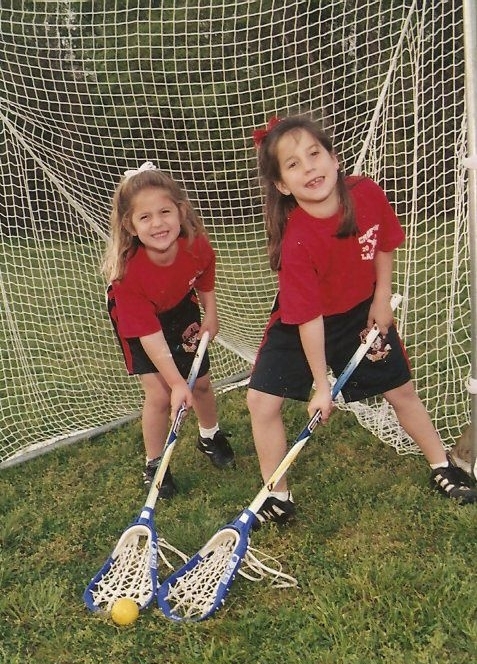 I was always an active kid, playing multiple sports, but lacrosse always had my heart. As I kept falling more in love with the sport, I started having problems in my feet causing pain when I ran. Sure enough, someone suggested I try goalie and as any kid first trying it I liked it but wasn't sure it was for me. The years went by and high school was growing closer. There was no doubt in my mind that I wanted to play goalie all of the time, so in 8th grade I decided to play 100%. High school is when things started to get a little crazy. I was always a perfectionist growing up (this probably should've been my parents first indication to never let me play goalie), but it wasn't until high school that I started to feel the immense pressure of the position and attempted to develop that "mental toughness" thing that everyone talks about goalies needing. Also, I was a weird kid, and still am. Yes, it is true all goalies are weird and I love it! I tell all my goalies to embrace the weird, because being normal is boring. I transferred halfway through my sophomore year to St. Mary's High School in Annapolis and although things were going great in school and socially, playing lacrosse year round and going through the recruiting process was so much to handle. After pushing through it, something clicked and I earned a scholarship to Stanford University. It was a dream come true. My senior year, I was on cloud nine, and played like it. I earned accolades of First-Team All-Met, Under Armour All-American, US Lacrosse All-American & Academic All-American, All Tewaaraton Team, and more. Stanford was the dream I had imagined, until school and practices started. On the first day of practice we didn't touch our sticks, we just ran. At the end of the practice, we had to run full field suicides and since I didn't make the times I had to run it again with all my teammates helping me through. I was so unbelievably unprepared and questioned what I got myself into. Then, I went to my first class where all the kids seemed like geniuses compared to me. Then again, I am not one of those people that's inherently smart. I'm inherently curious, and I want to read and study something until I know it. However, with much help from teammates and tutors, things got better in the classroom and I got in better shape. Things started to click on the field and although I wasn't playing much I was excited every time I stepped on the field. I was just waiting for my opportunity to play. My big moment came in the final game of the MPSF Tournament. We were down by 7 and Coach Amy Bokker told me to warm up. I was so excited and nervous, but I went in there and made some saves which in turn must've gave some energy to my teammates as we started to come back. We ended up winning the game, and I was honored as the MPSF Tournament MVP. I couldn't believe it! We ended up losing to Florida in the first round of the NCAA Tournament, but I'll never forget that first year. I learned so much and it would fuel me the rest of my years at Stanford. Sophomore year you could say was a blur. I was the only goalie and I remember doing everything I could to make sure that I wouldn't get hurt. After losing an amazing senior class, we struggled to fill in the gaps. Even though our team wasn’t as strong, with less pressure to succeed, I played well, earning a spot on the Tewaaraton Watchlist entering my junior season. Another bright point during my sophomore year was beginning to share my story with others through US Lacrosse Magazine. Through sharing my story, I heard from parents and players how my words helped them in some way. It was unbelievably rewarding. Throughout college, my mental game was constantly up and down. All that pushing through I'd always done was wearing on me. I didn't know how to deal with it all. Alas, the roller coaster that was my senior year. I was dealing with the fact that soon, lacrosse would be over. This thing that was my whole world. I was always "lyndslaxx" to everyone, lacrosse was who I was. But I wondered, who is Lyndsey without lacrosse? I had no idea. I was trying to find a job in the communications field, and struggling to find what I wanted. I came out to my family, friends, and teammates about being gay. Needless to say, it was a lot. I tried everything to help with my mental state both on and off the field. In hindsight "tried" is really like doing something for 3 days and saying it didn't work. I would have bad games and I couldn't get past it, letting down teammates, coaches, family, myself. Lacrosse used to bring me such joy and it was causing me so much pain -- from myself! I ended up getting benched in our last game of the year and it tore me apart even more. After graduating, I went home to Crofton, MD in hopes of finding a job somewhere nearby. However, despite me thinking my involvement with lacrosse was over, it seems the universe had other plans. While on a break from job hunting, I naturally went on Facebook to distract myself. 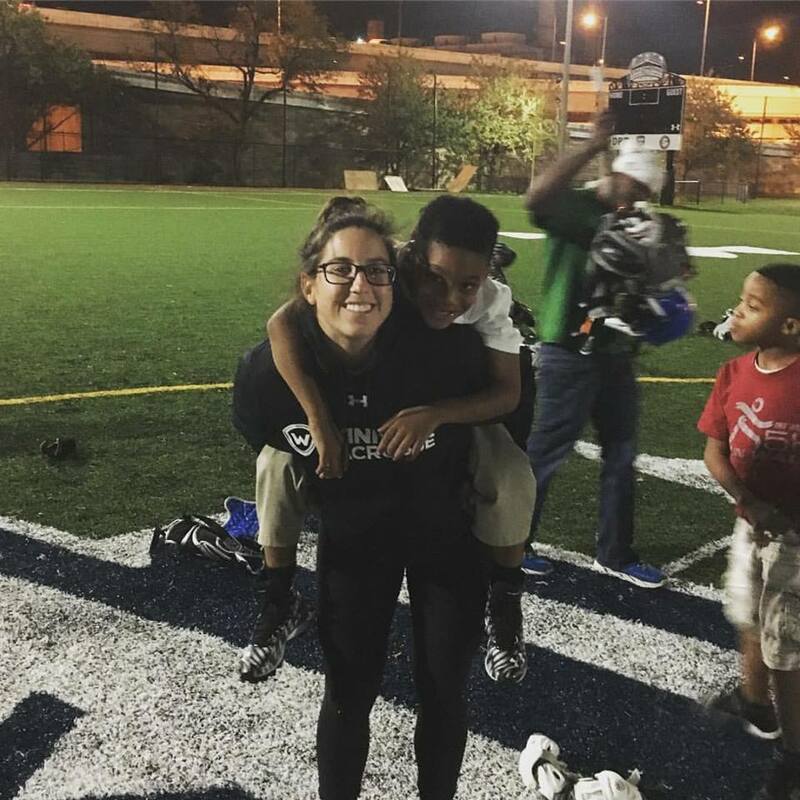 I saw a video pop up about an organization called the Washington Inner City Lacrosse Foundation (aka WINNERS Lacrosse). After seeing the video, I wanted to get involved immediately however I could. I received a response shortly after, saying that a position was available to be the program director if I was interested in applying. After a little while, I found out I got the job! Working at WINNERS was an incredible experience. The kids, parents, coaches, board members, everyone was just amazing. Being around these kids who had no idea what the sport was, and watching them fall in love and smile the entire time made me find my passion and love for the game again. I will forever be thankful for that. It was also during this time that I found meditation, a skill that I "tried" in college but hadn't really understood until recently. It has opened my eyes and the way that I coach goalies to prepare them to stay mindful in the cage. While at WINNERS, I was also working with goalies individually when I could and loving every second of it. I'd help with some goalie clinics here and there, but always wanted to do more. It wasn't until I gave a coaches goalie clinic that something was sparked inside of me. In a room with about 30 coaches I stood in front of them and told them all about stance, how to save the ball, warming up goalies, how to pick your goalie, etc. I was able to answer any questions they had, and I realized that a lot of coaches really don't know how to coach goalies. The thought sat with me for awhile, and I decided to launch the site. After working in a corporate setting, I decided to make the move to pursue my love of coaching this sport full time to California. I launched this site originally with the intent to provide only goalie training information and help, but as time as gone on, I've realized I love everything about this game and I want to share as much as I can and help as many girls as I can. I've come to learn that it's not just goalies that need help, but a lot of field players too. This is especially true around aspects of the mental game, and things players usually ignore like nutrition, hydration, and sleep. Now that I've been training for a year, I can provide help with improving skills from every angle of the game. If there are any topics you wish I would discuss feel free to email me at anytime at lmlaxtraining@gmail.com. If you want to see what I can do for you or your organization click here to view my services. Are you one of those people that wants to jump right in? Check out my blog! You can follow me on these social media channels: Facebook, Twitter, Instagram, and YouTube. Click here to sign up for updates on new content.